Hi everyone – We haven’t written since before Sally’s funeral and Celebration of Life. It’s hard to believe that we lost Sally three months ago, it honestly feels like so much longer since we last held our beautiful little girl or heard her sweet voice. We’ve included some links below to photos and videos from November 3rd, when we celebrated Sally’s life. The turnout of you, her village, was incredible as over 700 people attended. Friends traveled from all over the country, including childhood ones we haven’t seen in years. Our family was overwhelmed with the love and support we received that day, and are so thankful for the hard work several of our friends put into making it happen. Sally’s funeral in the church was obviously very difficult for us, but it was fitting for our little girl. Nicole delivered a moving eulogy that you can see in the video link below. 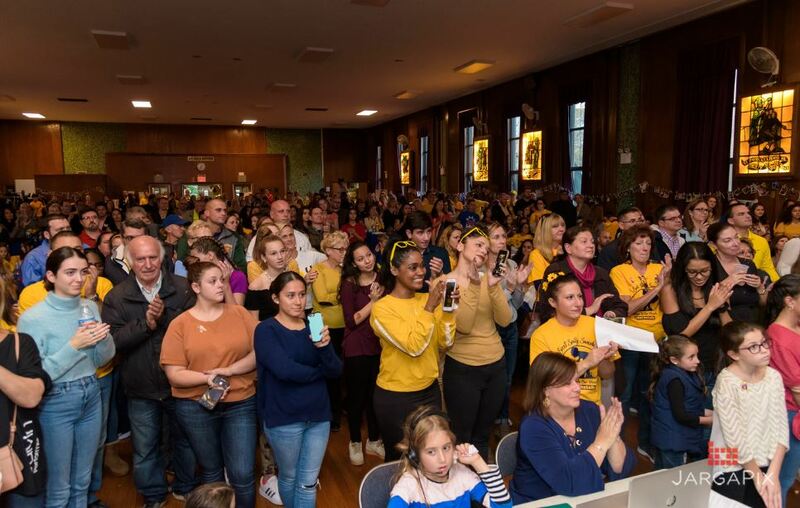 Knowing how much Sally loved giving hi-fives, Fr. Greg surprised everyone (including us) by replacing the traditional handshake for the sign of peace during mass by asking everyone to hi-five instead. The chorus of slaps throughout the church brought a smile to our faces, Sally would have loved it. Our friend Sydney Sherwood did an incredible, powerful and moving rendition of You Are My Sunshine, using Sally’s name in the final verse which even brings me to tears writing this. After the funeral, we filled the church’s auditorium with hundreds of supporters and everyone got their party on as we hoped. Kids had fun at the sand table and doing all of the Sally-inspired crafts. We even caught some adults doing them too. There was food and beverage galore thanks to all of the wonderful local restaurants who donated enough for everyone there. There was a DJ, wonderful dance performances and even a flash mob. We can’t express how much seeing everyone celebrating Sally meant to us, it was truly a party our little girl herself would have loved. Being that the funeral was held so long after Sally’s passing due to uncontrollable circumstances, St. Patrick’s and McLaughlin Funeral Home took such incredible care of us throughout the process. 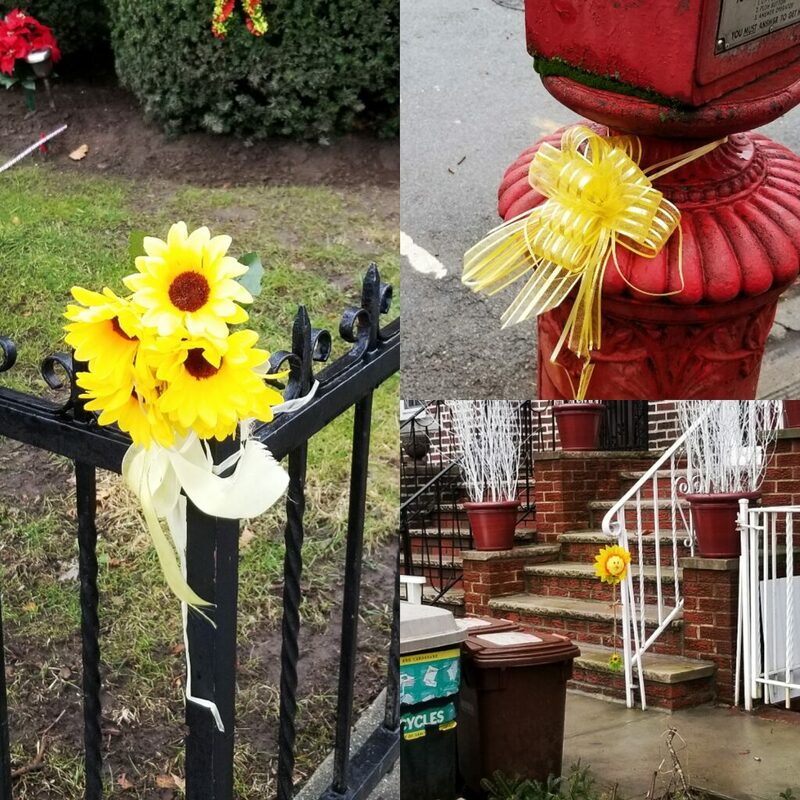 They even picked up the majority of Sally’s funeral, cremation and burial costs to remove some of the hardship we were enduring, knowing the positive impact Sally had on the neighborhood. On Monday morning following the funeral, we held a very small and private burial for Sally’s ashes in the pouring rain. Sally loved playing in the water, so we think it was her way of trying to interject some fun into what was a moment of difficult closure for us. I took Sally’s urn and as everyone was getting out of their cars, rocked gently back and forth with it as I had done with her so many times over the years before carrying her one last time to her final resting place with tears flowing down my face. At the end we each placed a sunflower on her urn and said our final goodbyes, I thanked her for being such an amazing daughter and told her how proud I am to be her dad. Sally’s ashes are buried in Brooklyn with her Great Grandma Sally, and where Nicole and I will eventually be reunited with her one day. While walking Charlie, we continue to see signs of Sally all over Bay Ridge. Three months later and we’re even findin new ones. That week was the start of our “new normal.” I returned full time back to work and we all started to settle into a new routine. Since then we’ve honestly had to take it one day at a time, sometimes an hour at a time as our emotions continue to fluctuate. The best way to describe it is it’s like standing ankle-deep in the water at the beach. Often the pain of missing Sally feels like small waves smacking your legs, other times the waves are so intense that you can barely stand your ground. Sometimes an unseen tidal wave of extreme sadness and grief crashes into you and takes you down unexpectedly. Despite that, Nicole and I get up to tackle the next waves. Just like Sally always did. Be like Sally. Just before Sally died, Nicole and I took a walk outside the hospital and vowed that should the worst happen, we would go on living life the best we could and work hard to keep joy in our lives. Not only for ourselves and the boys, but for Sally. Trust us when we say it would be very easy for us to get sucked into a deep depression, the constant tug is always there. But never in a million years would Sally want that for us. To be antisocial, depressed or to stop making new memories. In the hardest of times, of which there were many, our family would always make the best of it. We’d seek out and find joy. If there was none, we’d create it ourselves. That’s who we Brooklyn Kabels are, and are determined to continue to be. Especially now. For example, most of you know we are a huge Christmas family, we’re the ones who always have our decorations up right after Halloween. The holiday got us through the hard times, Sally herself LOVED Christmas. She sang Jingle Bells and watched Christmas specials year-round. I looked recently and the last show she watched on her Netflix account was a Curious George Christmas. We had to make the decision whether to keep our excitement up this year, or to scale back. Some even asked if we’d celebrate Christmas. We asked ourselves, what would Sally want? The answer was easy. We know she’d want us to go all-in, so that’s what we’re doing. The weekend after the funeral we put our decorations and Christmas trees up. Yes, not only one tree this year, but two. We have Christmas music playing 24/7 in our home, and Hallmark Christmas movies on almost as much. I went on wearing my Santa hat every day, even to work. 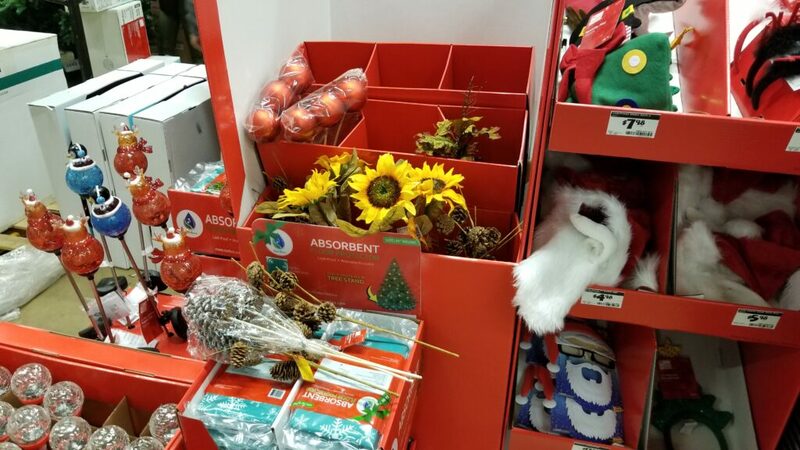 While getting some additional decorations, we spotted these sunflowers randomly tucked in the Christmas section. We think it was Sally telling us it was OK to go all-in on Christmas. This is not easy, in fact it’s actually very difficult and requires a ton of energy. It starts in the morning, every day we essentially wake up into a nightmare, if we sleep much at all. The reality of our girl being gone smacks us in the face in the first few seconds, yet we get out of bed and force ourselves to live life. It’s like swimming against a current that’s trying to drag you down, every fiber of your being wants you to crawl into a ball. There are constant triggers that make us emotional. Putting Sally’s stocking up was extremely difficult, knowing Santa wouldn’t be filling it again. Seeing her name on our tree skirt. Finding her ornaments. Hearing Christmas songs she liked. Thinking about what Christmas will be like without her. Honestly, we cry every single day, but we also know that to avoid the holiday wouldn’t be any easier, especially in the long-term. We power through it because it’s what Sally would want. Be like Sally. 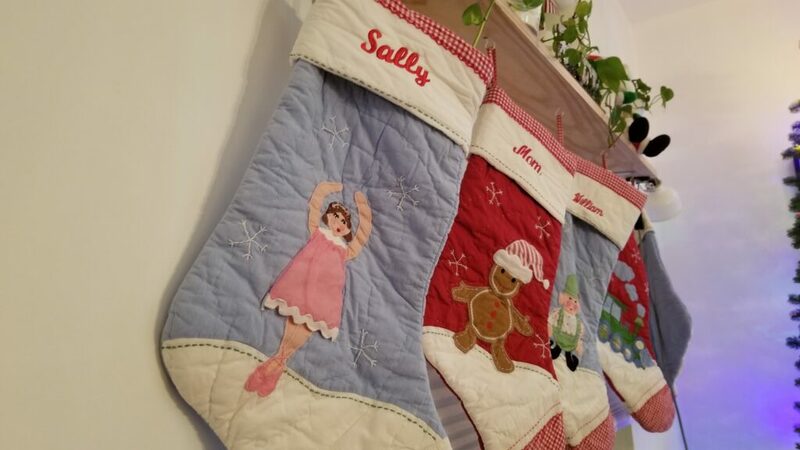 Hanging Sally’s stocking was incredibly difficult. It’s not just Christmas though, we’re taking this approach in our everyday lives. We go out of our way to be sociable and make the effort to talk about more than just how much we miss Sally. I’ve had a few people tell me recently they were scared to speak to me, not knowing what to say. After speaking to me, they were relieved to see that we can still carry on a conversation, and sometimes even laugh. Others were hesitant to bring up Sally to us, or even to post a photo or memory of her. We’ve had to assure our friends that although we’re grieving, to not have those fears. We love hearing from all of you, having you stop us in the street, or even just sending a text or message. We also want to know how YOU are doing. We know life has to go on, and we care about how your lives are going too. That doesn’t mean we aren’t sad underneath our smiles or laughs, but we can’t (and refuse to) let that sadness consume or transform us. And please never…ever…be afraid to bring up Sally to us. You all possess the greatest gift anyone could give our family – the ability to speak of our little girl, and we want her name to be spoken. We want to see her face pop up on social media. We want to hear about all the things that make you think of Sally or remember her. That’s our little girl and it comforts us to have her continue being a part of our lives. One day three different people sent me something that made them think of Sally in the span of an hour, it was almost as if she was calling us. We’re also proud of Thomas and William, despite losing their little sister in their first weeks of school both did well on their first quarter report cards, are keeping busy at activities and continue to keep us on our toes on a daily basis. They often bring us much-needed smiles and laughs, and keep us going every day. Recently we’ve begun to speak to them more about Sally and their feelings as time has passed. Kids process grief differently than adults, but we are realizing they’re struggling with the emotions of missing Sally much like we are. Maybe even as much as we are. Both boys sleep with a lantern on that has photos of Sally on it, they miss her terribly. We’re learning how to talk to them about it and ensuring we all have an outlet when things get tough. 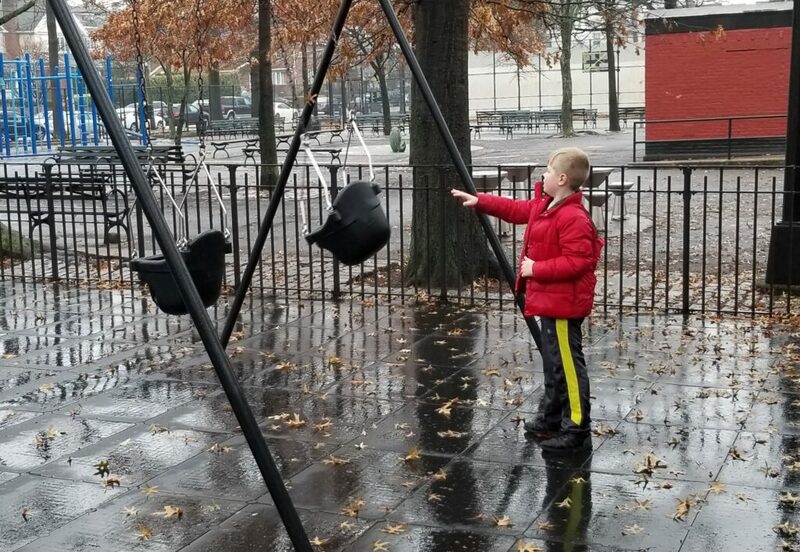 We visited Sally’s favorite playground this weekend, William recalled his favorite memories of her there and did all the things she loved to do. Watching him push an empty swing was heartbreaking, but know it was thereaputic for him. 1) Be Like Sally – which means to love others unconditionally, to not sweat the small stuff, to be kind, to dance, to smile, to find joy even when it’s hard, to get up when you fall. 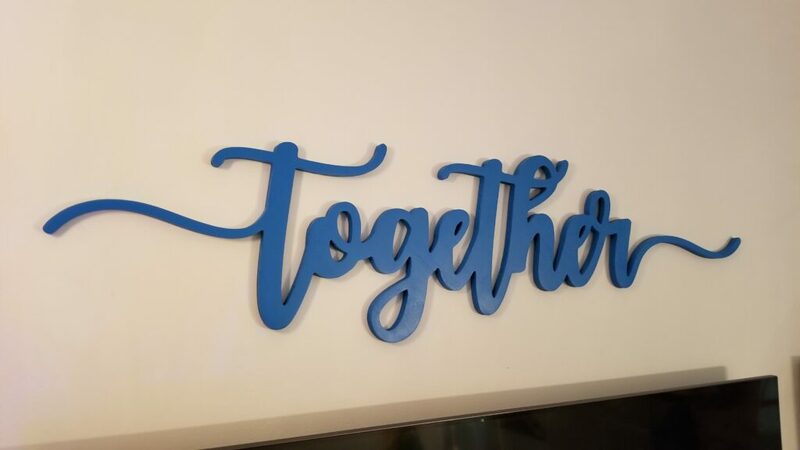 2) Together – Sally would always ask us to do things or go places “together”. She always wanted to experience things with us. When we have a difficult task or are having a hard time, we remember that we’re in this together as a family. We can still hear her voice saying that word, and say it out loud ourselves often in trying moments. Hanging in our living room. Those mottoes are our way of ensuring Sally is still our guiding light. I was asked once what mission Sally left us. For now, we feel our mission is to find the path that will allow us to grieve, yet still live our lives and experience joy and happiness through it. Hopefully we find it. Maybe one day we’ll even be able to show that path to others in our situation, but for now, we are working hard to maintain the balance between missing our little girl, and being like her. 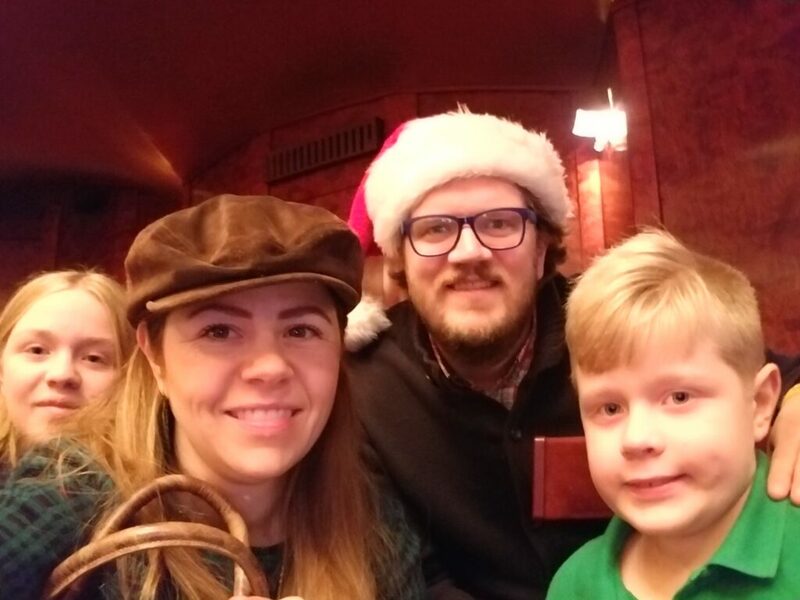 We get out to create new memories when we can, this weekend we attended a Christmas show and an opera. Sally is still with us, but in our hearts. 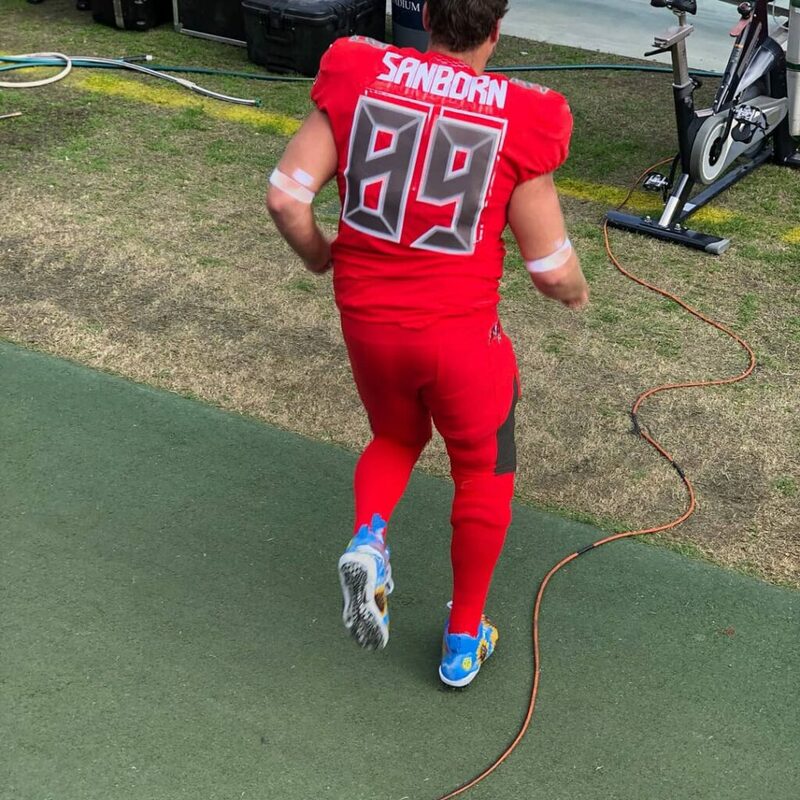 Former long snapper for the Buffalo Bills, and current Tampa Bay Buccaneer (and our friend) Garrison Sanborn designed and wore special cleats in honor of Sally earlier this month. They are being auctioned with money raised going to Arms Wide Open. You can learn more or bid on them by clicking here. Thanks to all of you for your continued love and support. This journey we’re on isn’t easy, but having you in our lives means the world and keeps us going. We wish you all a wonderful Christmas, Happy Holidays and a Happy New Year. Please keep Sally and our family in your thoughts and prayers. Matt, this is beautiful. It made me cry reading it. You have always expressed your feelings about Sally with such grace and generosity. Be like Sally. Your such beautiful amazing people! Have a blessed Christmas all of you . This is so sad and beautiful to hear. I lost my son Seth to the cure for his malignant brain tumor and I can still only feel flatness. It has been 10 years. Together you all will survive, wishing you hope. Such an Amazing Family ! 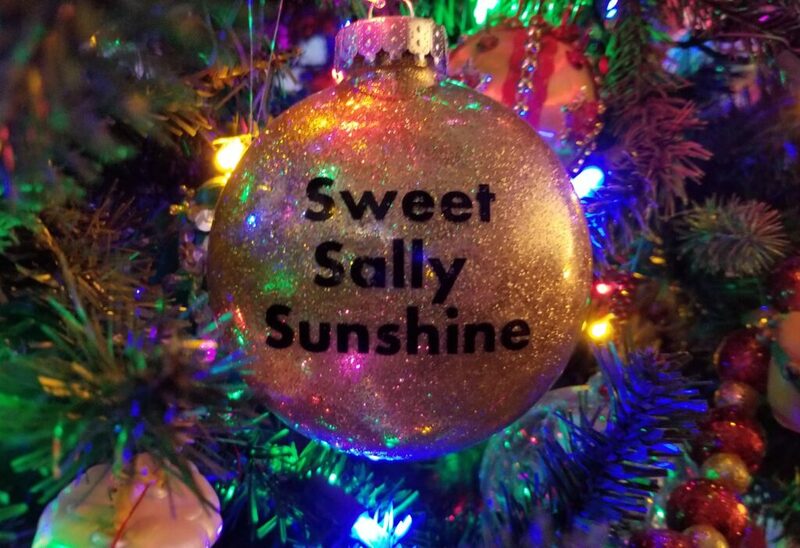 I’m sure Sweet Sally is watching over her family from above ! May God Bless you and hold you all close in your grief and Love !! You are all remarkable and inspirational. My heart goes out to you. I know the deep grief you feel is not only emotional but physical. I think of Sally often and as promised I light a candle for her every day. I am sure each day you wonder how you can make it through. Your positive determination is the best and hardest myou can do. I wish you a Christmas filled with love and courage. My thoughts and prayers are with your family. We miss Sally as well. I admire your families bravery to share your feelings and smile. Your words are loving and a testimony to the meaning of “Together”. Thank you for sharing your feelings, it is moving to witness your Love. I am running a race on behalf of my 9-year old friend Felicia who is going through chemo, and I would like to run for Sally as well. 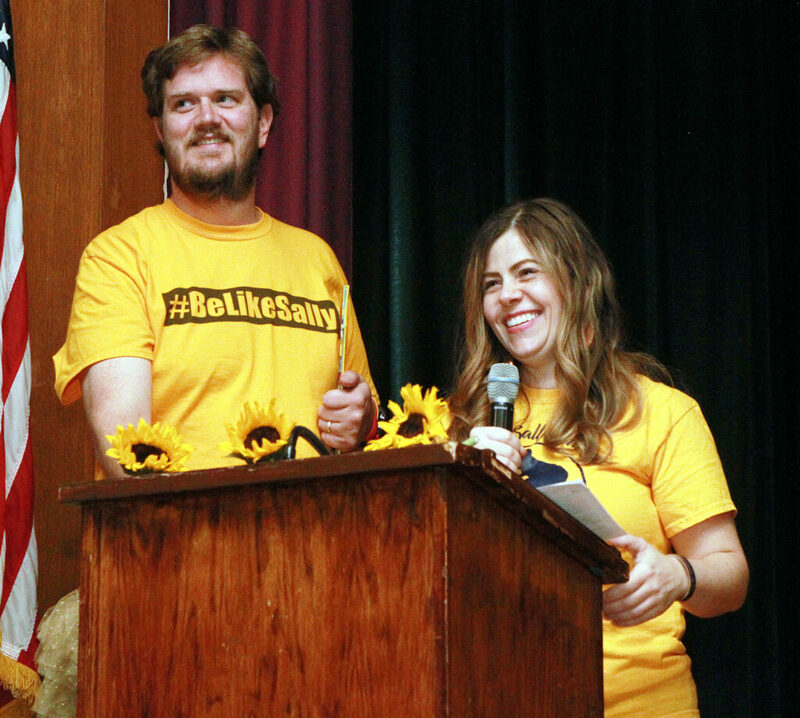 May I incorporate a sunflower into the logo for this event in Sally’s honor? I thought of Sally as I wondered what I could do to bring awareness to childhood cancer and help Felicia, my answer is to run 100 miles on March 9th under 24 hours. The campaign is called FELICIA For Every Life Impacted Community In Action. My goal is to raise money for her and awareness for childhood cancer. 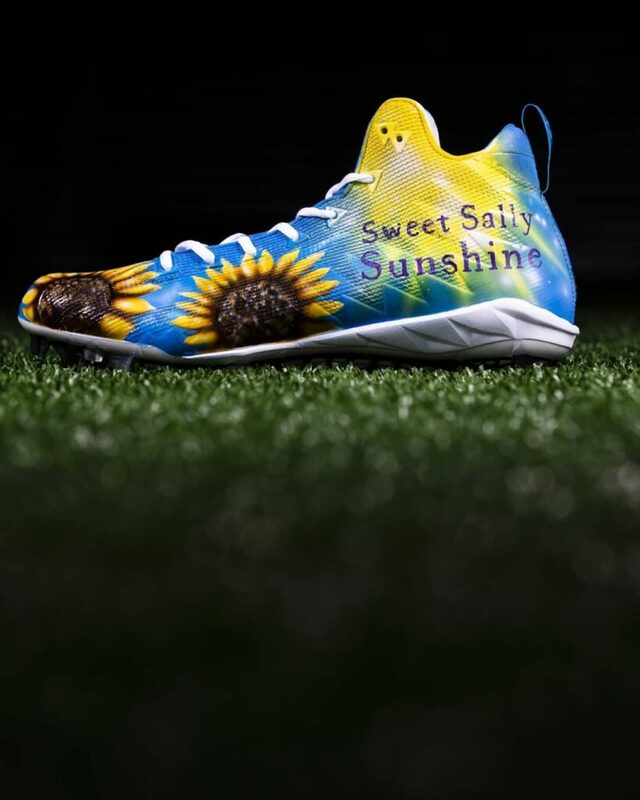 It would be an honor to run with Sally’s sunflower as I train and race, may I? What message can I deliver about childhood cancer? I love you Nicole for your smile and joy. I love you Matt for your devotion to your family and exemplary love of your wife. I love your children for their inocesance and kindness. really, no words. We continue to pray for Sweet Sally Sunshine every night and her amazing family who loved her and miss her so much. Sending love, hugs and warm wishes for a blessed Christmas and peace in your hearts in 2019. You are an inspirational family! Sending my love and my wish that we all can BE LIKE SALLY. As Christmas nears I think of you (the Kabel Family) often and say a prayer that you can still find joy in this season although you are grieving the loss of your sweet Sally. Matt, describe you life without Sally so well that I can tell that Sally is really watching over you, Nicole and the boys. She is your special guardian Angel. I love angels and have many on my tree but there is one that really reminds me of Sally. It’s a little blond haired angel hanging onto a star. When I look at her I will pray to Sally for all of you. God bless and may you have a Blessed Christmas and a wonderful New Year. Matt, you and Nicole are the most amazing people I have ever met. Your beautiful sharing of Sally’s incredible journey, though short and painful, has inspired so many of us. May you continue to feel the prayers and support of all those she – and you – have touched. I hope this becomes a book some day, to inspire future generations. God bless.